Asiatic Public Relations Network (Pvt.) 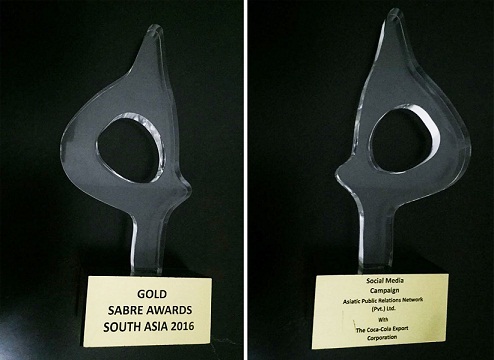 Ltd., a leading PR agency of Pakistan, established nearly 25 years ago, has been declared as the winner of the category Social Media Campaign, of the 2016 Gold SABRE Awards South Asia. The prestigious SABRE Awards for Excellence in Public Relations Programming attract close to 5,000 entries globally each year and provide the premier showcase for the best that public relations has to offer. Asiatic Public Relations Network (Pvt.) Limited, established in May 1992 as an independent entity, emerged from Asiatic Advertising which itself was founded in 1963. As such APR has a rich history of over 50 years behind it. Today APR is a leading communications and public relations agency in Pakistan, affiliated internationally with H+K Strategies. APR provides a comprehensive bouquet of services to its national and multinational blue-chip clients, including PR counseling, issues and crisis management, CSR and sustainability counseling, media relations, digital media outreach through its specialized unit, APR CONNECT, specialized trainings through APR IMPACT, strategic writing and content development, creative design, event management, stakeholder engagement, audio-visual productions and publications.